Tuesday, 12 February 2019, 1:24p.m. More than 23,000 pre-sale tickets to Elton John's Mission Estate show have sold out in less than an hour. Pre-sale tickets went live online on the Mission's website at 9am, with users reporting that more than 30,000 were in the queue. By 10.05am the pre-sale tickets were sold out. Nearly 23,500 tickets had been sold, a Mission spokesman said. The winery venue's capacity is roughly 26,000. 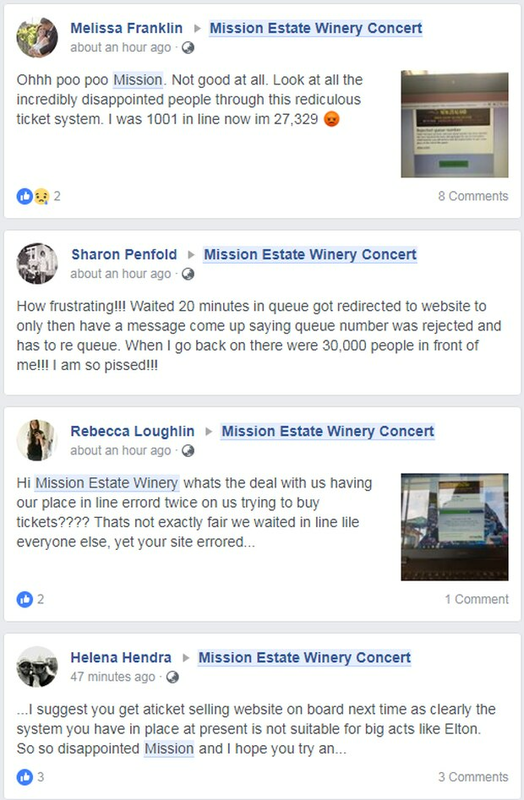 Many fans on social media complained about the system, claiming they were in the process of purchasing tickets before being pushed to the back of the queue. Mission Estate CEO Peter Holley said no formal complaints had been laid with it as at 11am. "At this moment in time no formal complaints have been made regarding the system, but we will have our IT department look into it," said Holley. Robinson logged on fifteen minutes before the tickets went on sale, having already signed up as a member and was listed 1083 in the queue. Some fans have also turned to Twitter trying get a second concert organised for those who missed out. For Robinson it's a lost opportunity for a once in a lifetime experience. Elton will be performing at Mission Estate on February 8 next year as part of his Farewell Yellow Brick Road world tour. He will also play in Auckland and Dunedin.